Kid’s and General Craft Contributor, Gillian from the blog “Dried Figs and Wooden Spools”. 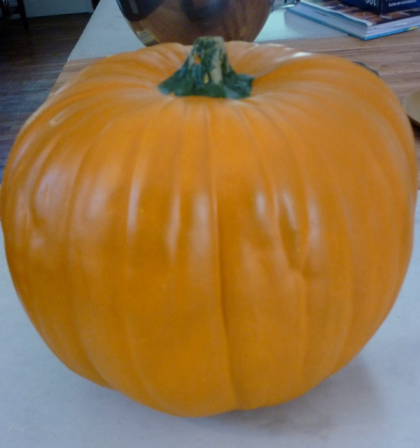 Every year, as we get ready to host our annual pumpkin carving party, I promise myself that I am going to carve or decorate some really cool pumpkins to have on display before the party. But between menu planning, crafts-for-the-kids planning and all the inevitable last minute details that come when you have your entire neighborhood over for an afternoon, the pumpkins get pushed to the bottom of the list. Generally I look around after the party and realize that every family on the block has a newly carved pumpkin except ours. Next year! I tell myself! Well, next year has come. I’m making an early start with the pumpkins by venturing into the realms of fake gourds. I’ve seen them for years, heard the craft pundits rave about their versatility, but somehow have never broken down and bought one. But when I got the idea for this pumpkin I decided that the time had come. I was not going to spend all that time decorating a pumpkin that would rot away in a few weeks time. The inspiration for this came from a magazine I flipped though while in line at the grocery store one day. 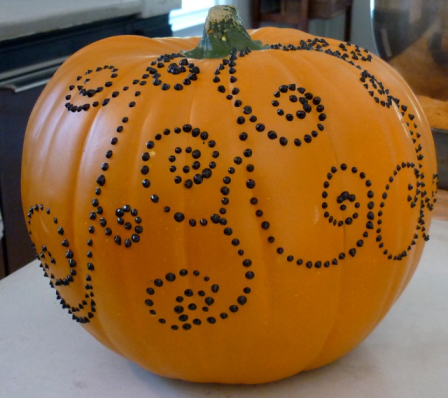 The pumpkin on the glossy pages was covered in tiny rhinestones which looked great but probably cost more than I was willing to spend. Instead I opted for glossy black puff paint and a few rhinestones accents. After sketching out the swirls and loops with a pencil, I went to work with the paint, dotting carefully along the lines. It was often easier to start at the end of the swirl and work backwards toward the stem and I did stop at the halfway point to allow the paint to dry before proceeding with the rest. And although the project was definitely time consuming, it was also fairly easy once I got into the dot dot dot rhythm. 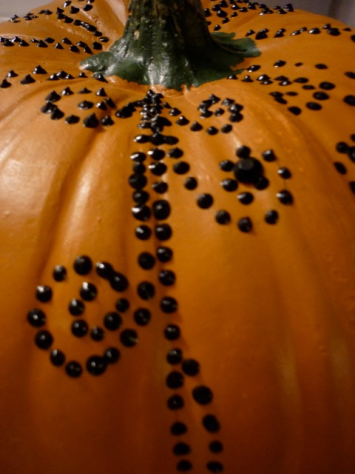 Once the entire pumpkin was covered I went back and glued a handful of rhinestone in strategic places. Such as the spot where my son decided to “see if the paint was dry”. The finished project looks elegant and spooky at the same time. The perfect combination for this year’s not so kid like but not scary either decor. In fact, I might just have to make another with that white pumpkin I bought the other day. Because you can never have too many cool looking pumpkins in October! This entry was posted in Craft Trends, Crafts, Fall, Halloween, Holidays & Seasons on October 16, 2009 by Gillian. Gillian Grimm lives in Charlottesville, Virginia where she balances writing, cooking and crafts with eight chickens, two kids, a dog, a cat and a husband. As the daughter of a Journalist, she grew up all over the United States, switching schools, towns and newspapers every few years and loved every minute of it! She now works as a freelance writer, primarily in the craft industry but with a few forays into travel writing, narrative non-fiction and educational matters. Gillian was recently published in the literary journal the “The Northville Review”. You can find more of Gillian’s work at “Dried Figs and Wooden Spools”. Absolutely exquisite ! It gives me idea for a lot of things I could do for christmas too. Thanks a lot. I love this. 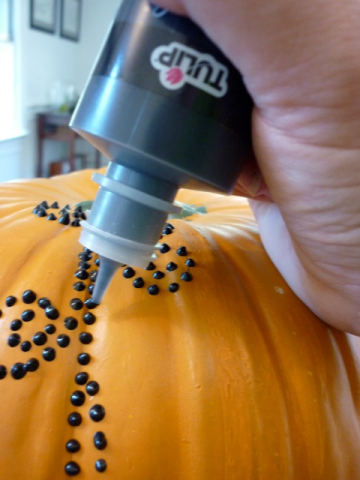 Will fabric paint work for the pumpkin? 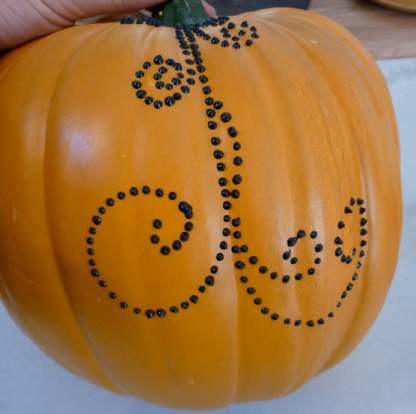 This is a wonderful website and this article is exactly what I was looking for to include in my article on carving and decorating pumpkins. I hope you don’t mind my using it. 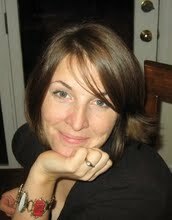 I also linked back to your website and will add you to my blog roll. I’ve also bookmarked you so when I have time I can make some of the beautiful things you are crafting! Thanks for the inspiration! I made an awesome project inspired by this post. Here’s the link. This is gorgeous! Found you on Pinterest, thank you for sharing! What do you think about using glow-in-the-dark paint? Love this idea. Great job. I’ve never seen this glow in the dark puff paint. Did it really glow? Any pics? Unfortunately, this is a case of a Pinterest caption gone awry. This is just plain black puff paint. No glow in the dark paint was used. Thanks for putting this up, I just went through your entire blog and you are awesome! I have it bookmarked now. I am making these for Christmas for my 3 kids and my 2 nieces. Except I am making them for colored pencils as we live in AZ and crayons melt in the car. I am thinking colored pencils are normally 7″ long – but I would make the front panel just long enough to secure the pencils – because they get shorter as they get used. Thank you again!!!! God Bless!!!! Merry Christmas everyone!!! I recently purchased a secondary coverstitch (juki 1000) since I was annoyed with converting the serger in the middle of a project. Oddly though I still rarely use it. I sew 90% of the project on the serger, (regular overlock seam 4 thread) and then depending on the knit I will either hem it on my sewing machine with a single needle, or that’s when I will pull out the coverstitch for the hem. My advice to anyone would be to get the best serger you can afford, you won’t ever be sorry you have one. If the day comes that you have extra money and you want to expand your skills go for a coverstitch. I thought it would be life changing but really all it does is hems and that’s something my other machines could do as well, but now when I hem I have to find 4 spools of matching thread. Hope that helps! Love this ~ I’m featuring it today on my site with the full acknowledgment (and links) of you as the originator. If this presents any problem whatsoever please let me know and have a wonderful weekend!